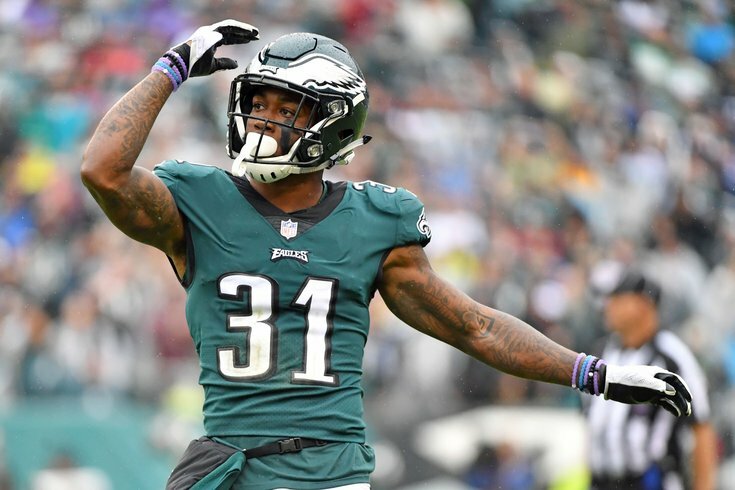 Jalen Mills is one of several Eagles cornerbacks scheduled to hit the open market next offseason. With the 2019 NFL Draft upcoming, one of the considerations the Philadelphia Eagles will have to take into account is who they project to be on the roster in 2020 and beyond. With that in mind, here's an early look at which Eagles players are currently scheduled to become free agents next offseason. While it's a sizable list, the vast majority of the Eagles' core players are locked up. Mailbag: Why can't the Eagles draft a running back or a linebacker in the first round already? To note, we'll include select players who have team options for the 2020 season. We'll omit team option players like Lane Johnson, for example, whose options certainly won't be declined. • Carson Wentz (UFA): Technically, Wentz is scheduled to become an unrestricted free agent in 2020. He won't, of course, because the Eagles will unquestionably use their fifth-year option on him absent a long-term contract extension. The deadline to do so is May 3. • Nate Sudfeld (UFA): Sudfeld's upcoming free agency is flying under the radar a bit, but the reality is that assuming he is the No. 2 quarterback, he is an important player to the Eagles, especially considering the fact that Wentz has been unable to finish the last two seasons. • Jordan Howard (UFA): To be determined if Howard will be a one-year lease, or if the Eagles try to get a contract extension done with him. The guess here is that they'll wait and see how he performs in the Eagles' offense. If all goes well, the Eagles could try to get an in-season extension done, much like they did with Alshon Jeffery in 2017. • Corey Clement (RFA): Clement is scheduled to become a restricted free agent next offseason. An "original round" tender would only give the Eagles a right of first refusal should he sign an offer sheet elsewhere. They would receive no compensation in return if he left, since he was originally an undrafted free agent. If the Eagles placed a second-round tender on him, that could get a little pricey, depending on the season he has in 2019. • Wendell Smallwood (UFA): It feels like Smallwood has been on the team for 8 years. • Josh Adams (EFRA): With fewer than three accrued seasons in the NFL, Adams would cost next to nothing for the team to retain as an exclusive rights free agent next offseason. • Nelson Agholor (UFA): The Eagles exercised Agholor's 2019 fifth-year option last offseason, and opted to retain him once that money became fully guaranteed at the start of the new league year last month. He'll be an unrestricted free agent next offseason. • Jason Peters (UFA): This has to be Peters' last season, right? But, like, for real this time? • Halapoulivaati Vaitai (UFA): I'm sure the Eagles would like to keep Vaitai as their "swing tackle," but Vaitai might be wise to see if he can get starting-money offers on the open market next offseason, in a league desperate for OL help. • Chris Long (UFA): There's still a question as to whether Long will even continue to play this season, much less next season. • Vinny Curry (UFA): Curry signed a one-year "prove it" deal this offseason. • Treyvon Hester (RFA): Hester played well in a rotational role last year. If he can build on that in 2019, the team will likely tender him at either the second-round or original round tender. He was originally a seventh-round pick in 2017. • Nigel Bradham (team option): Technically, Bradham's contract runs through the 2022 season, but the Eagles have team options in 2020, 2021, and 2022. If the Eagles keep him in 2020, Bradham is scheduled to count for $9,767,500 on the salary cap. It would be a savings of $4,465,000 -- with $5,302,500 in dead money -- if they declined the option. • Kamu Grugier-Hill (UFA): While Smallwood feels like he's been with the team longer than he has, Grugier-Hill has the exact same tenure. He'll be a free agent in 2020 as well. • Paul Worrilow (UFA): Worrilow signed back with the team after tearing his ACL in OTAs last year. • L.J. Fort (team option): The Eagles signed Fort to a three-year deal this offseason, but it's really more like a series of one-year deals, as they have team options in 2020 and 2021. • Jalen Mills (UFA): Mills is an interesting player to watch, in terms of how the team views him going forward. Jim Schwartz values him more than anyone. Is his future at corner or safety? What is his realistic market, and what does Mills think his market will be? Those could be two very different things. • Ronald Darby (UFA): Darby will likely test the open market once again in 2020, after being disappointed by a lack of interest from teams who were certainly wary of the torn ACL he suffered in 2018. • Cre'Von LeBlanc (UFA): LeBlanc was a pleasant surprise as an in-season acquisition last year. If he sticks on the roster in 2019, as expected, he'll have the necessary four accrued seasons to hit unrestricted free agency. That'll make three potentially contributing corners who are slated to hit the open market next spring. • Rodney McLeod (UFA): Part of McLeod's restructure this offseason shaved off some years on the back end of his contract. He'll be a free agent next offseason. • Tre' Sullivan (ERFA): Sullivan will cost next to nothing if the Eagles want to retain him next year. • Andrew Sendejo (UFA): Sendejo better hope that Stefen Wisniewski, Jay Ajayi, or Timmy Jernigan sign compensatory pick-qualifying contracts before the May 7 deadline, thus preserving the projected fourth-round pick the Eagles are set to receive for the loss of Jordan Hicks. If not, the Eagles would be foolish to keep Sendejo this season in favor of that projected 2020 fourth-round pick. • Jake Elliott (RFA): The Eagles can probably get away with tendering Elliott at his "original round" tender next offseason, seeing as he was originally a fifth-round pick. • Rick Lovato (RFA): The Eagles won't tender Lovato at over $2 million on an original round contract. I imagine they will either work out a more team-friendly deal, or they'll find a cheaper long snapper. • Cameron Johnston (ERFA): Again, as an exclusive rights free agent, Johnston will cost next to nothing to retain next year.